Advanced combustion modeling capabilities are available in CRUNCH CFD® for efficient simulations of large finite-rate chemistry mechanisms. Chemical kinetic models can be specified by the user using the CANTERA toolkit as a chemistry manager. In a CHEMKIN® compatible format. Virtually all reaction rate parameters are supported e.g. Lindemann, Troe and SRI pressure dependent rates. For efficient computations of stiff chemistry mechanisms, an In-Situ Adaptive Tabulation (ISAT) is available for no additional cost. Laminar Flamelet models are available for rapid computation of large chemistry sets with a Flamelet table generator tool kit available for use. The combination of these advanced chemistry capabiltiies in conjunction with capabilities to handle non-ideal near critical fluids provides an advanced capability to model a wide range of high pressure and cryogenic combustion problems as illustrated here for a LOX, hydrogen system at near critical pressure of 5 MPa. 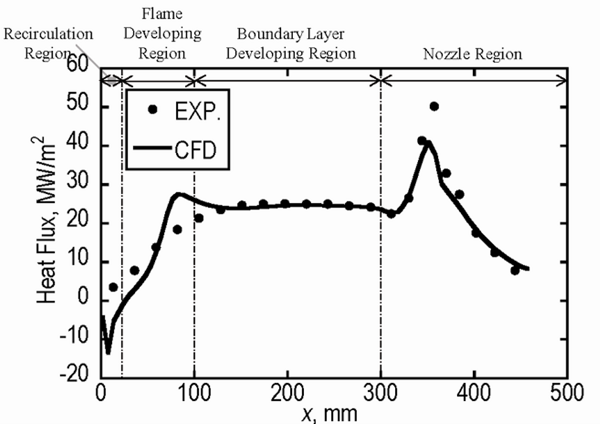 Comparison of wall heat flux distribution between CFD solution and experiment.